Samuel Armenteros was simply on a whole different level all night. 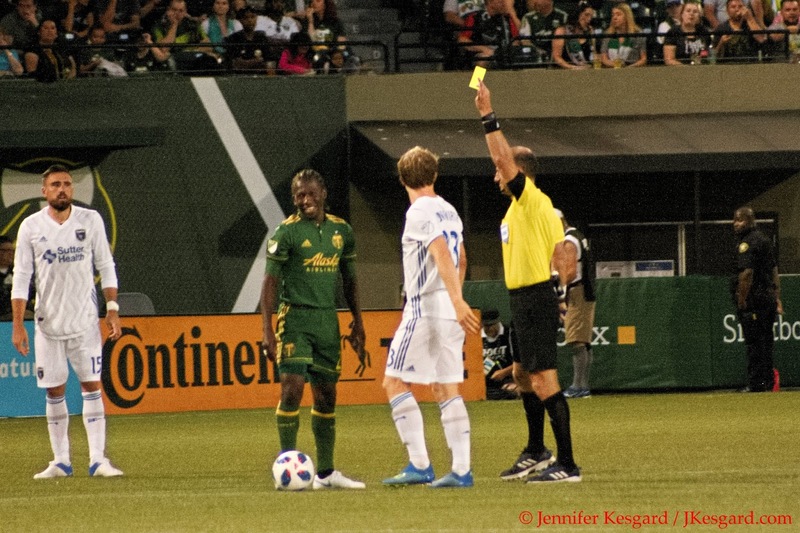 It's always an adventure when the San Jose Earthquakes visit the Portland Timbers, and the third meeting in 2018 between the sides continued the theme of unpredictability. While San Jose hasn't won in Portland in the MLS era during league play, the Earthquakes have forced Portland into some difficult situations with an odd bounce, well-timed penalty or taking advantage of a mistake over the years. With the Timbers holding onto a long unbeaten streak in league play that started in April, Portland was hoping to extend their mark another match against a San Jose side that still hasn't figured out what their identity is, and for the first 75 minutes of the match, Portland was in complete control and seemed to be well on their way to the result. The last 15 minutes, however, featured a sputtering Timbers offense once the substitutes began to enter, a defensive gaffe that allowed the Earthquakes to put a goal on the board, and ended with a scrambling Portland team that effectively held on for dear life to secure a 2 to 1 victory. 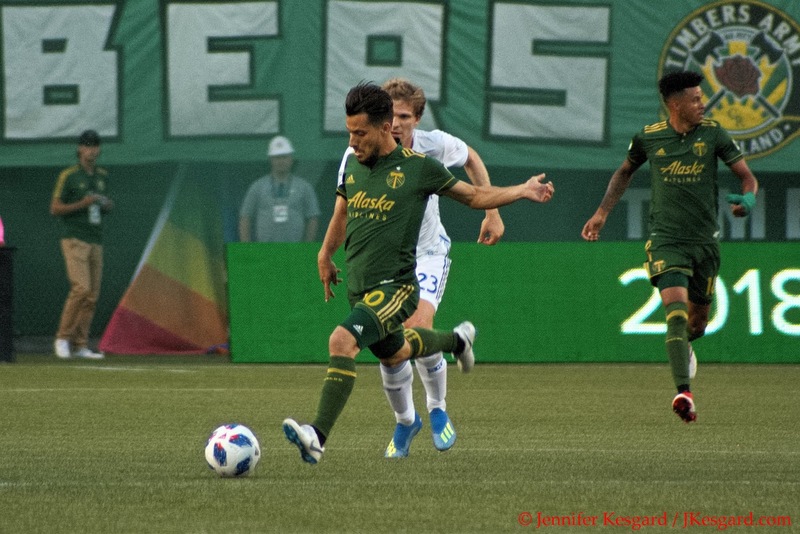 While the victory does indeed extend the unbeaten streak, the Timbers didn't make it very easy on the nerves for anybody - but they did just enough to get the full points. Timbers Coach Gio Savarese has been talking a lot about his team's flexibility and adaptability being big components of the overall success in 2018, and we've witnessed several different variations of the Timbers over the past weeks. This has also been aided by several different players stepping up to contribute to the lengthy level of success, as it's not been just one person or persons that have added something. It's a testament to the overall depth that Portland is enjoying that players are being pushed for playing time, and they've responded with impressive results, both here and at the Timbers 2 level. However, the margin between success and failure is rather minute, and if that point wasn't very evident, consider this match as testament to that fact. For all of their success over the first 75 minutes in terms of pressure, precision and goals, the Timbers did little wrong, but over a sequence of a quarter hour, the gains were nearly lost in a sea of uncertainty and tentative play showing little margin of error. For as good as the Timbers have been over this now thirteen match unbeaten streak, they can't turn off their focus for a moment's notice otherwise to allow their opponent any ability to gain confidence in themselves, especially since the Western Conference race is so tight that a deserving side or two might be left out of the postseason. 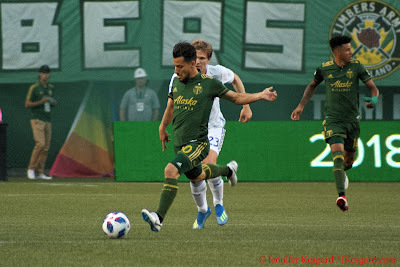 Sebastian Blanco was back for the Timbers and the offense was more inspired. After securing the victory in Flounder Land last weekend for their first MLS victory ever at Century Link Field, Savarese was excited about the news that both David Guzman and Andy Polo had returned from international duty, and Fanendo Adi was also fully available after suffering through a few knocks over the past weeks. Sebastian Blanco was also at full fitness after missing last week, so Savarese had his full compliment of attacking options available for this match. 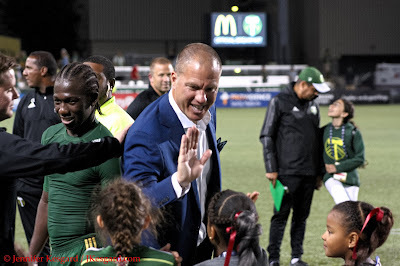 Savarese kept some of his starting options the same, however, as Jeff Attinella once again manned the goal for Portland behind the defensive line of Alvas Powell, Zarek Valentin, Larrys Mabiala and Julio Cascante, the same group that started over the past three matches. Instead of playing the Christmas Tree formation with 3 defensive midfielders, 2 attacking midfielders, and 1 striker, Savarese went for 4 midfielders and 2 strikers with a diamond in the middle with Diego Chara and Lawrence Olum as defensive mids with Blanco and Diego Valeri as the midfielder wingers. Samuel Armenteros would start paired up with Dairon Asprilla as the second striker, but Adi would be waiting on the bench for his turn as needed. Guzman and Polo would be available as a sub along with Adi, while Savarese also selected Vytas, Bill Tuiloma, Andres Flores and Jake Gleeson as available reinforcements. Depending upon the score or situation, Savarese had versatile and adaptable options if he needed to change things up. Most media folks that don't follow San Jose regularly are still trying to figure out what direction the Earthquakes are following because it appears they are coming apart at the seams. After another dreadful season, San Jose invested in improving their attacking options with Magnus Eriksson, Vako Qazaishvili, Jahmir Hyka and Danny Hoesen to surround longtime scorer Chris Wondolowski to bolster their goal scoring, and it's been an improvement from previous years where they couldn't score at all. Unfortunately, their defense and goalkeeping hasn't enjoyed as much investment although there are several younger names in their academy to help there. Technical Director Chris Leitch and Coach Mikael Stahre have been patient as the young Quakes are trying to find their true sense of self and playing style, but it's come at the expense of wins with the Earthquakes having just 2 wins over Minnesota United so far in 2018. One trait that has never been lacking for the Earthquakes is tenacity, and while they might be struggling collectively, the team still continues to battle each and every week. Stahre played most of his big offensive threats with Wondo and Hoesen being the dual strike threat with Anibal Godoy, Vako, Florian Jungwirth and Eriksson manning the midfield. A big question for the Timbers would be if Chara and Olum could limit the influence of Vako and Godoy, the more creative influences of the midfield foursome. Diego Chara is all smiles, even when he's getting a caution for a soft foul. The match itself started out very strangely with Center Official Ted Unkel brandishing a card nearly after the opening whistle, when San Jose center back Harold Cummings fouled Asprilla on a break holding his kit on a breakaway. Mabiala has been on a scoring roll lately with goals in his last 2 matches consecutively, and he just missed on a header in the 2nd minute off an early corner kick. But the early scoring threat was Armenteros, who tallied his 5th and 6th goals of 2018 in spectacular fashion. Vako was dribbling the ball on the left heading North and he launched a pass to Wondo at the midfield stripe, but Olum was able to punch the ball away to Armenteros. Samuel dropped the ball back to Valeri, then took off for the left post as Diego drove towards goal until Valeri put a diagonal pass right to Armenteros, who had shook off and turned about his mark and easily tapped the ball past San Jose goalkeeper Andrew Tarbell. Armenteros had 2 other quality chances in the first half in the 19th and 24th minutes and two rushed shots in the 44th and 45th minutes, as he was the focal point of the attack. The 44th minute effort was a spinning bicycle kick that Samuel pushed over the woodwork, but it showed how dialed in number 99 was on the night. Blanco had a good shot off a cross in the 30th minute blocked away, but otherwise, it was the Armenteros show as the Timbers held the one goal lead into the break. San Jose played relatively passive soccer in the first 45 minutes with just two blocked shots in stoppage time off great defense from Valentin and Mabiala and a Wondo miss in the 29th minute off a give and go for their offense, but Stahre had his team inject more pace and movement after the break. Their task was made more difficult in the 53rd minute when Attinella made an easy save and dropped a pass to Blanco just outside the Timbers box. Sebastian found Valeri midpitch and Diego put an expertly placed pass to Armenteros forward with 2 Earthquake defenders flanking him. Some deft maneuvering and great touches by the Timbers forward later, Armemteros put the ball past Tarbell for his second brace in 2018 and 6th overall goal in MLS play. 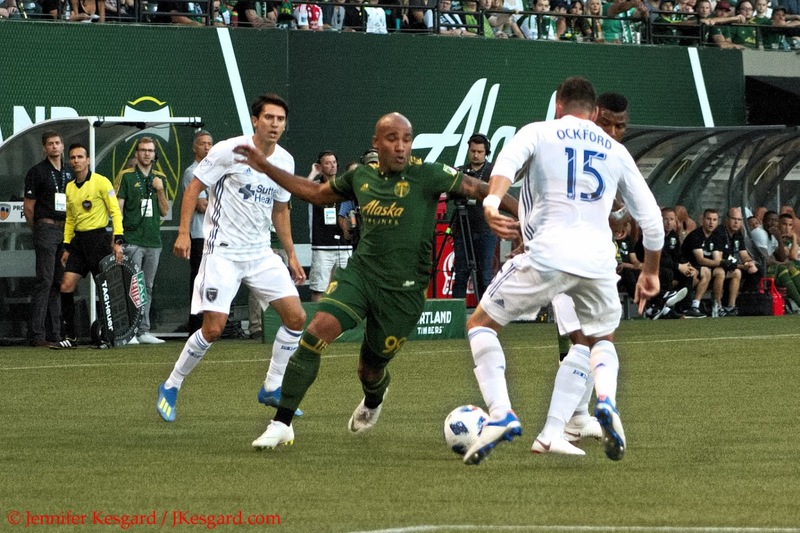 The next several minutes was a resounding quest to see if the Timbers could get their first hat trick in MLS play for Armenteros, and he came close in the 57th minute after Asprilla had a shot blocked by Tarbell while in the box. Samuel pounced on the rebound, but pushed his effort wide left. San Jose had a point blank shot by substitute Quincy Amarikwa in the 60th minute off a cross from Vako, and Amarikwa did the half bicycle shot off the cross for good measure, but Attinella made the safe and the offside flag was also up to stop the play. Armenteros had another good effort in the 67th minute, and Blanco one-timed a shot off a Powell cross in the 74th minute that didn't miss by much. At this point, it looked like the Timbers were in complete and total control and it was just a matter of what the final margin would be. The complexion changed in the 77th minute when Adi entered for Armenteros, and Blanco was replaced by Flores, and whatever precision was on display for the home side, it seemed to go away once the subs started. San Jose found space in the 82nd minute with a shot from Hyka, who had replaced Eriksson, and Vako pulled another shot wide just second later. Savarese gave Powell the rest of the night off in the 85th minute with Vytas entering as his replacement, but miscommunication between Vytas, Cascante and Mabiala left Jungwirth in open space in the box off an Amarikwa pass, and Florian punched a well placed shot past Attinella in the 87th minute to give San Jose hope. San Jose and Portland then staged an exciting back and forth battle in the dying minutes with Jungwirth and sub Shea Salinas both missing goal by mere inches, while the Timbers were unable to find their target late. The final whistle blew moments later, but a very comfortable and in control match went very much off the rails late, and San Jose was extremely close to either leveling the score or taking the lead. Portland has now gone from an average side with emerging talent to a threat in the Western Conference, and as such, the team will need to work on their mental acumen to avoid such letdowns. Then again, this was a topic that this very site covered in the match preview that lacked cats and predictions, but did ask the question of what will the Timbers do now that they are the hunted. Portland now travels to Los Angeles for an odd doubleheader with LAFC at Banc of California Stadium - a league match on July 15th after the World Cup final followed on July 18th with a U.S. Open Cup semi-final match - before they enjoy an extended homestand of four matches against Montreal, Houston, Philadelphia and Vancouver before an August midweek trip to D.C. United on August 15 and Sporting Kansas City on August 18th. After a compressed home stand with Seattle and Toronto visiting Providence Park to finish August, the schedule equals out somewhat when September officially hits. Portland still sits tied in fourth in the standings, but at just under 2 points per match with several home matches forthcoming, Portland is sitting fairly well at this point of the year with reinforcements coming soon. But they can't get too overconfident or lose their focus because something could happen to change their fate, and if anything shows how possible that was, it was this match with the Earthquakes.